My daughter Silvia sent me these two Paulie collages for my amusement, and I thought they might be appreciated here. 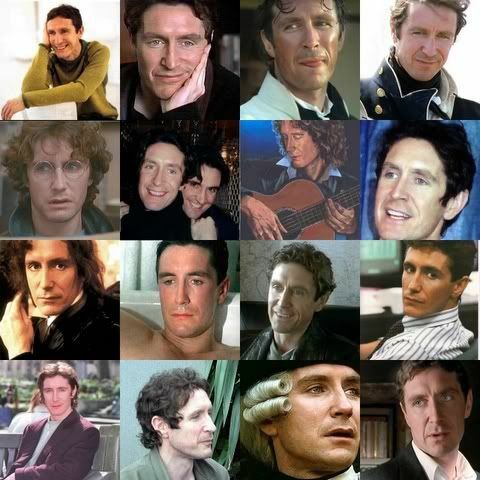 A man of a thousand faces, huh? They sure are appreciated here Thanks Estelle for posting them and thank your daughter for making this collage. Is she a fan also? 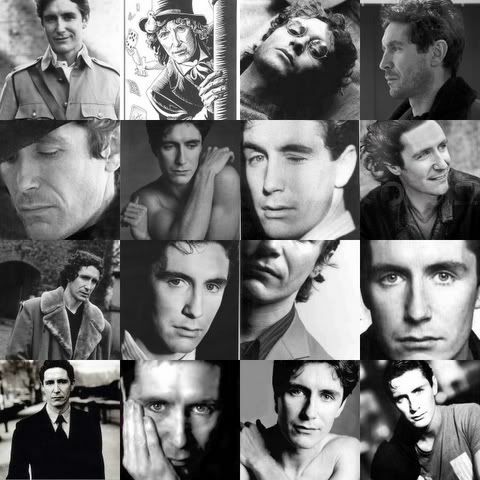 I like this picture in the black and white collage, in the right corner at the top, where is having a bit of a beard. Do you know from what movie that is? breathtaking wall posters with a simple silver frame, don't you think? Sylvia, the picture you refer to, is from Gypo. Thanks Estelle! To you and your daughter! These are beautiful, Estelle! I'm especially drawn to b&w pics because I think they show detail and shading so much more dramatically - the color doesn't get in the way. My daughter Silvia said she couldn't sleep one night and thought she'd make me a collage. She got the pictures from the Library and then used Picasa (a cute photo-edit program from google) to arrange them. She's not actually a fan though, and her husband thinks she facilitates my obsession. LOL! I'd been thinking of juxtaposing images of young and old Paul after I read a comment at Outpost Gallifrey that he seemed to be aging well. And then Silvia me the collages which do just that. As Catherine said, the picture of Paul with a bit of a beard is from Gypo. Maddy rendered some of my caps in black and white, and these latter look really good. This colour one is absolutely gorgeous! Both of them would make breathtaking wall posters with a simple silver frame, don't you think? The images would have to redone for printing. As it is, they're small and would lose resolution if enlarged. No, Silvia didn't get anyone's permission, Catherine. She retrieved the photos from the Library for her little project. She said she thought about posting the results in the comment section of my myspace profile and then decided it would be better to send them to me in an e-mail instead. I love Romanza, too, and have Carolyn's originial painting which she did at my request. Yes, I thought both collages were gorgeous. I was very pleasantly surprised when I saw the goodies from Silvia. Yeah, I understand what you mean about losing resolution, Estelle. They would still make lovely framed pictures...for a nightstand, maybe? right of "Thais". Those three do make a beautiful musical triptych. I was just wondering about the permission thing, as I would love to have her permission to use "Romanza" as an avatar. I'd previously gotten permission from Carolyn to post her pictures at various sites, and she just requested that they be posted as small versions. I'm sure she wouldn't mind your using Romanza as an avatar. The picture I'm using as my online icon is a piece called Symphony of the Night which my son Patrick did. As it is, I have my print beside my bed. It's the last thing I see at night and the first thing I see in the morning. It's to the right of "Nocturne Interlude", which is to the right of "Thais". Those three do make a beautiful musical triptych. I thought they might be appreciated here. Where would these pictures NOT be appreciated?!!!!! romantic feel of all four paintings. mind. It would make such a lovely avatar. Good point Michelle! I can't imagine those pictures not being appreciated! displayed" for the rest. Any ideas on what's up? Yeah, this is a great work she did, Estelle! I love them all and I would love to have it like ONE avatar together! That would be cooooool, or? I thought she had used powerpoint. A friend of mine makes similar collages of her holiday photos with it. I think the one your daughter has used looks better. and her husband thinks she facilitates my obsession. LOL!